Matilda is hot. Maude has a certain appeal. How ’bout this obscure form of the name? Thanks to Filipa for suggesting Mafalda as our Baby Name of the Day. If you speak Italian or Portuguese, you might recognize Mafalda as yet another form of Matilda, that powerful Germanic name with a quirky vibe. 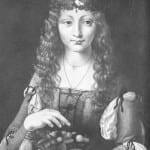 Plenty of high profile women from both Italy and Portugal have worn the names – princesses, opera singers, and more. Back in the twelfth century, Matilda of Savoy married King Afonso I, the first king of Portugal. The historical record tends to call her Matilda, but she became Mafalda in Portuguese. It was an era when names were fluid, and a princess who married into another language would almost always become known by an equivalent in her new language. Mahaut, an old French form, worn by the future queen’s mother. This may have been the name the future queen was given at birth. Maud, the daughter of King Henry I of England, and wife of Holy Roman Emperor Henry V.
That Maude was named after her mother, Matilda of Scotland – born Edith. 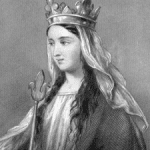 She took the name of her godmother, Queen Matilda of Flanders – also known as Maud, Mathilde, and Mathilda. Mafalda has been a royal name ever since. A granddaughter of Afonso I founded an abbey at Arouca and is known as Blessed Mafalda. How did the ’til’ become a ‘fal’? 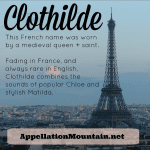 It’s not clear, but maybe the Mathilde spelling caused confusion. There’s no ‘th’ in Italian, and the Portuguese ‘th’ is very different. It appears to be an assimilation of a foreign name – one that stuck. Fast-forward to the twentieth century, when King Victor Emmanuel III and Queen Elena of Italy gave the name to a daughter. Mafalda Maria Elisabetta Anna Romano was born in 1902, the second of four principessas in her family. In 1925, Mafalda married Philip, Landgrave of Hesse. Philip joined the Nazi party, and eventually became an agent for Hitler in Italy as well as at home. The Landgravine disliked the Führer, and made no secret of it. Mafalda – once described by Hitler as “the blackest carrion in the Italian royal house” was sent to Buchenwald after Italy’s surrender, and died there. She’s now considered heroic. A 2006 Italian mini-series was titled Mafalda of Savoy: The Courage of a Princess. Back in the 1910s and 20s, Mafalda made brief appearances in the US Top 1000. She faded quickly as the US entered the war, and has nearly disappeared. In other parts of the world she’s more common, thanks to a long-running Argentine comic strip character by the time. The whip-smart, rebellious Mafalda debuted in 1964. Her original run lasted through 1973. She reminds me of Roald Dahl’s Matilda. That explains Mafaldas elsewhere in the world, but how would she wear in the US? There’s a minor character in the Harry Potter series, Mafalda Hopkirk. And on Clarissa Explains it All, Clarissa had an annoying Aunt Mafalda. Call this name a puzzle – there’s something vintage and glittering about it, a name from another world. At the same time, she’s so little known in English that it might take some explaining. And without an easy nickname, you’d have to really love Mafalda to use this name. But if you’re after a Portuguese heritage choice, she might be an appealing rarity to consider. What do you think of Mafalda? Is she wearable in the US? I don’t get the appeal of this name either. The ‘Alda’ nickname does help a lot, but otherwise, it feels like the sort of name that would be Maleficent’s sister. This seems to be the sort of ethnic name that is less international and more regionally specific. I have to agree with Filipa, it really is a love or hate name in Portugal. I fall on the other side of the coin – this is one name that I simply don’t get, at all. It does seem to fit the Portuguese name trends though, so it doesn’t surprise me that it’s being used a lot there. My husband’s Italian grandmother is named Mafalda, and I have always been intrigued by her name. It has such a great history and meaning, but I don’t think I would be brave enough to use it as a first name. Oh, and Mafalda goes by Maf rhymes with Calf. For a child today, I think Alda would be a lovely nickname; its vintage feel is right on-trend. Oh, Alda for Mafalda is lovely! Oh, so GOOD to hear your perspective, Filipa. And how nice to know Mafalda is stylish in Portugal!